Hi-Tech knew that it would only be a matter of time before such compounds would be discovered by milestone sports nutrition research. As the years passed, Hi-Tech funded an abundance of its own internal research into the matter; and continued to scour the scientific journals for creatine-based scientific revelations. Hi-Tech finally reached the end of what has been the longest, most exhaustive road of research, experimentation, and product development in the history of the company—the completion of a quest to create a creatine product that would not only live up to the reputation of the Phosphagen name, but that would also take that legendary name to a whole new level of recognition. The result of this quest is a technologically advanced creatine formulation that allows all those who seek to build muscle to capitalize on the potential of a fully charged phosphagen system. Almost exactly twenty years after EAS launched Phosphagen, Hi-Tech is launching a new and improved Phosphagen! 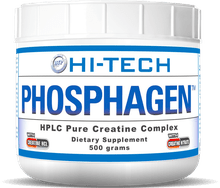 The new Phosphagen optimizes the benefits of creatine supplementation because it doesn’t just stop with incorporating the finest ingredients to enhance creatine availability for utilization in the phosphagen system. The new Phosphagen also incorporates ingredients that create a synergistic effect with creatine by enhancing creatine uptake and by delaying the onset of muscular fatigue during intense muscular contraction, thereby providing the creatine ingredients in Phosphagen with the opportunity to continue to perform longer in the phosphagen system. To ensure an uninterrupted supply of creatine to 1) enhance the anabolic effect of greater muscle cell volumization, including through increased protein synthesis, and 2) heighten and more rapidly mobilize concentrations of PCr muscle fuel to facilitate the rapid and sustained transfer of high-energy phosphate within the phosphagen system for ATP resynthesis, Phosphagen contains the most potent forms of creatine ever discovered: creatine nitrate, disodium creatine phosphate tetrahydrate, creatine phosphate, and creatine HCl. To ensure optimal utilization of creatine by 1) enhancing creatine uptake, and 2) by extending the duration of time in which creatine can continue to energize the work performance capability of the phosphagen system by delaying the onset of muscular fatigue, Phosphagen contains guanidinopropionic acid (a creatine analog), shown to enhance the uptake of creatine into muscle cells due to its insulinotropic properties, and beta-alanine, shown to delay the onset of muscular fatigue through complementary pathways that provide additional time for creatine to contribute to the formation of PCr and resynthesis of ATP, thereby extending the duration and/or intensity of muscular contraction to elicit a greater hypertrophic response. 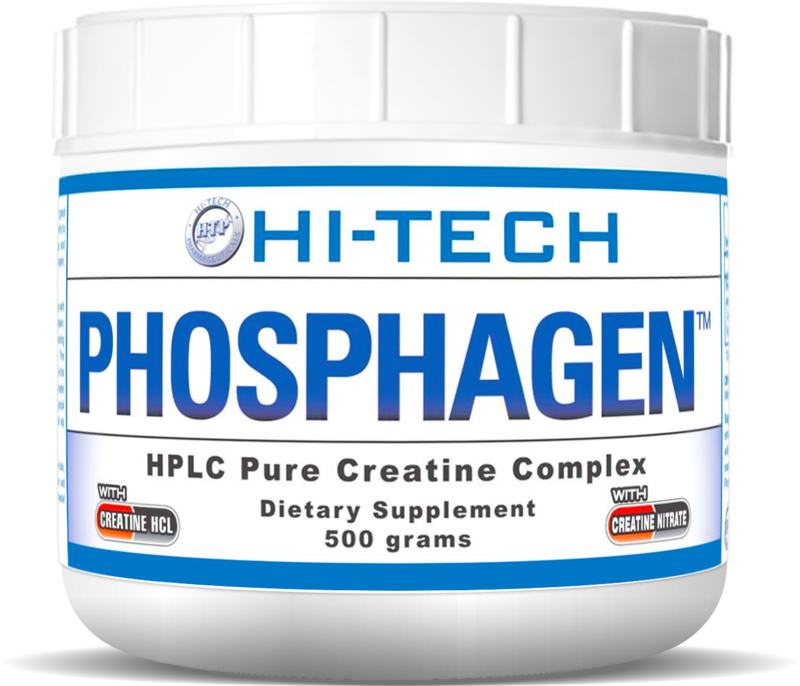 Without the contribution of these synergistic creatine ingredients, the phosphagen system quickly becomes bottlenecked during periods of intense muscular contraction, well before the potential contribution of creatine can be fully realized. Thus, the bodybuilder who wisely chooses Phosphagen over another typical creatine product will have the extra amount of muscle fuel available to complete the one additional rep required to pull the trigger for muscles to grow. Phosphagen is back to maximize the creatine endgame with renewed thinking outside the creatine box, which represents what creatine supplementation is capable of achieving in its most aggressive and comprehensive form. Phosphagen, by Hi-Tech… more weight… more reps… more muscle! Exotic Fruit This is a Buy 1 Get 1 FREE offer!